I love the chance to use colour and Lindsay and Mark’s wedding in October at Walton Hall Hotel gave me the perfect opportunity. 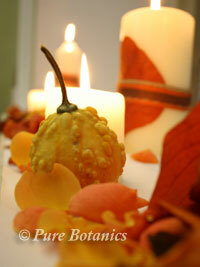 When I first met Lindsay she was very keen to use rich autumn wedding flowers throughout all her wedding decorations. 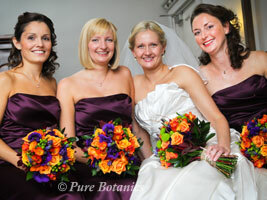 As the bridesmaids were wearing a deep purple we developed the idea of using very vibrant oranges and lime green to stand out infront of their dresses. 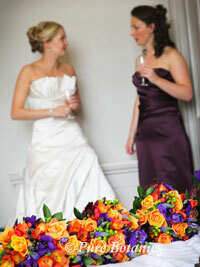 I also put purple into all the bouquets so that the colours of the dresses linked through to the wedding flowers. I really love this photo that Lindsay kindly sent through to me of all the girls together with their beautiful dress and bouquets. Lindsay had seen a bridal bouquet in our portfolio that featured delicate willow twigs and she was keen to use these in her bouquet. You can see them in the photo below. 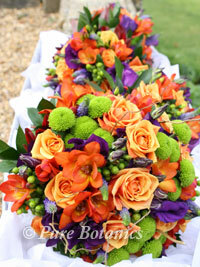 The autumn wedding flowers that I used in all the posy bouquets were orange roses, freesias, lime green chrysanthemums and purple lisianthus. 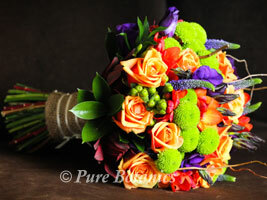 I love delivering the flowers on the morning of the wedding, as it’s always such an exciting time. 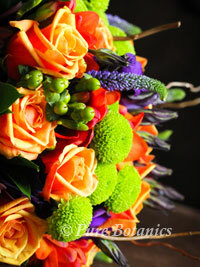 I just had a chance to photograph them before I hand them over. 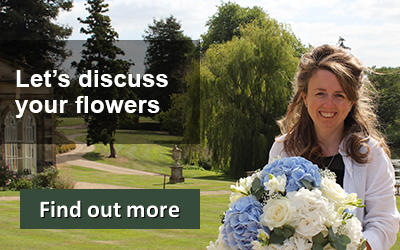 We have delivered countless wedding flowers to Walton Hall over the last seven years but all of them are totally different and special. 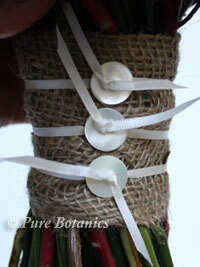 Lindsay loved the idea of using buttons on her bouquet handle and asked us to use the hessian, which formed the base, and then I put tiny pearl buttons over the top of it. The bridesmaids’ bouquets also had the same detailing on them. Mark and Lindsay chose to get married at St James Church, Walton. We love decorating this church and for this wedding we placed lots of large cream church candles on the windowsills surrounded by rich orange rose petals, autumn leaves, Chinese lanterns and small gauds. They looked wonderful trailing out along the lengths of theses deep windowsills. To coordinate this look I placed our silver candle stands at either side of the altar decorated with the same flowers as used in the bridal bouquets. 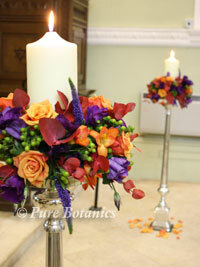 To give extra colour I sprinkled fresh orange rose petals around the base of the stands. 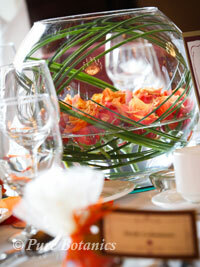 For the wedding centrepieces on the tables in the Moncrief at Walton Hall, Lindsay chose our large goldfish bowls that you can see in the photo here. I placed floating orange roses in them and surrounded them with rose petals and leaves to fit with the autumn wedding theme. 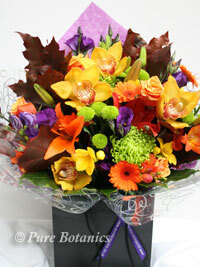 Even the Mums’ thank you bouquets coordinated with the theme you can see one of them in the photo below. 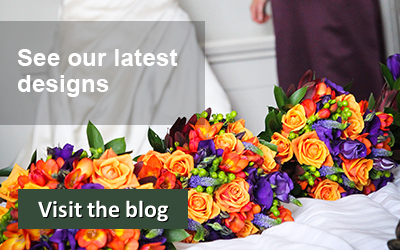 Not everyone that gets married in October chooses an autumn wedding flower theme but I think you will agree that it worked perfectly for Lindsay and Mark.